Aaiieee! Screamy voices must mean that it's time for a manga-inspired shoot-em-up! Ben Vost sighs. Back in the days when manga had never been heard of outside the land of the rising sun, and when cartoons were for kids, not spotty adolescents or grown-ups who hadn't quite, this game would have been a revelation - "Look at their big eyes and hear their squeaky voices!" Now we tend to take manga, or more properly, anime, in our stride. Not that we're immune to cute characterisation, but it's just not as innovative these days. However, the fact that Gunbee F99 is thoroughly steeped in anime doesn't mean that it's not a fun ride. As a game it's bog-standard, vertically scrolling shoot-em-up, with the usual array of power-ups and end-of-level bosses, but cure, y'know. It's not that brilliant though. The Xevious-style bombing aspect of it seems superfluous since you can avoid the slow-moving bullets that the ground-based forces chuck at you, and those without an auto-fire joystick will curse at the number of times they unleash a Firebeam instead of just a bullet. However, it is fun in that kind of addictive "one more go" way. It's "tweak" is that to power up your ship you can't just shoot all the enemies in a single wave - you've got to shoot clouds which will produce bells. You can catch the bells as they are and they'll give you 500 points, but to get power-ups you have to shoot them several times, bouncing them up the screen, at which point they'll turn a different colour and you can then catch them for the power-up. There's a complex idea in story mode where if you can bounce bells into waiting baskets you get extra lives, but this is pretty tricky and only works in story mode, which is much harder. And that's pretty much it. 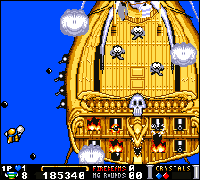 There's the usual end of level bosses which flash in the places you can hit them, and you even get a "shoot here!" sign if you haven't managed to hit them after a while. 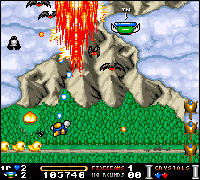 It also gets very tricky in that you tend to get more black bells (bad ones) if you're using an auto-fire joystick, but other than that it's not much different to any other shoot-em-up. It's nicer (and cheaper) than Ultra Violent Worlds and it'll certainly while away a rainy afternoon. However, be warned that it's not very stable on an '060. Getting killed behind the clouds. Something seems to be a waste of time. Cheap and very cheerful, this is a great value game, but it's not the most innovative.